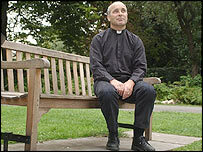 The new Bishop of Reading has been announced following the row over the earlier nomination of a gay cleric to the post. At a news conference in Reading, the 45-year-old pastor at Peterborough Cathedral and member of the College of Evangelists called for the church to "listen more" to the gay community. Meanwhile, church leaders have denied claims that the appointment of Canon Cottrell, a married father-of-three, was decided on his sexuality. 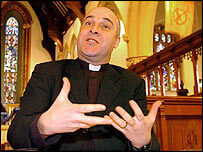 He takes the job which was turned down in 2003 by Canon Jeffrey John. Canon John withdrew his acceptance after a high-profile campaign against his appointment by Church of England traditionalists. The row was followed by the controversial consecration in the US of openly gay Canon Gene Robinson as Bishop of New Hampshire. Essex-born Canon Cottrell, who was ordained in 1984, having trained at St Stephen's House in Oxford, said of his nomination: "I am looking forward to becoming the next Bishop of Reading with a mixture of excitement and trepidation. "I believe my work in mission and evangelism has prepared me well for the challenges facing the church in this new century. "I hope and pray that my love for and understanding of the different traditions of the Church of England will enable me to be a focus for unity in the Reading Episcopal area." In a letter to clergy in the area, the Bishop of Oxford, the Right Reverend Richard Harries, said of Canon Cottrell: "He is strongly aware of the serious challenges facing the Church today, and believes passionately in the power of the gospel to transform individuals and communities." Canon Cottrell will be consecrated on 4 May.